2010 UPDATE: This is cool and interesting to read, but you should just go get this Free Outlook 2007/2010 No Reply All AddIn to do this work for you. UPDATE: To be clear. This technique does NOT send macros in your email. It only flips a metadata bit in the message and that metadata is only transmitted within Exchange (within your company). It is not propagated to outside email addresses. It's better than BCC because it doesn't break local Outlook Rules. It's harmless. I really hate it when I say "please send replies directly to me" and a Reply To All happens. It's not only a bummer for the person who sent it but also for everyone on the distribution list. Trivia: At Microsoft they/we say "little-r" me when we want a reply directly to us or "Big-R" when we mean Reply To All. I was thinking it'd be cool to have a button on my Outlook Message Form that prevented folks from Reply'ing to All or Forwarding the message. I poked around a bit trying to write an Outlook Macro and realized that I've completely overwritten all the brain cells that had previously held information about VBA macro programming. Seriously. I worked in VB3-6 for years. I was a ninja. Now I'm just an old fat guy with a Black Belt that used to fit. Anyway. I asked for help and KC Lemson pointed me to Bill Jacob, both actual ninjas, and he took my Rube Goldberg-ian plan and turned it into two lines of code. Doh. 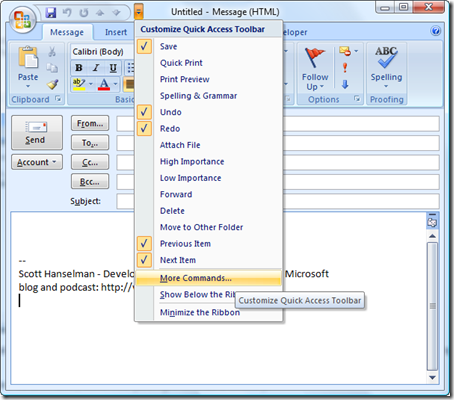 In the next dialog, type something like NoReplyAll and click Create. At this point, even when running Vista 64, you'll be magically transported back to 1996, completely with owner-draw non-standard gray toolbars and other bits of gray that will leak in from the past. 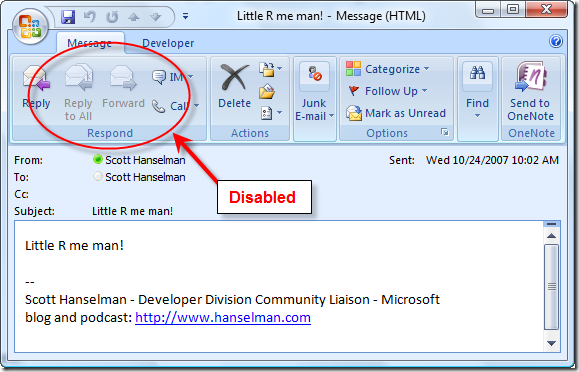 Now, open up a new Outlook Message and right click at the VERY top (assuming Outlook 2007). 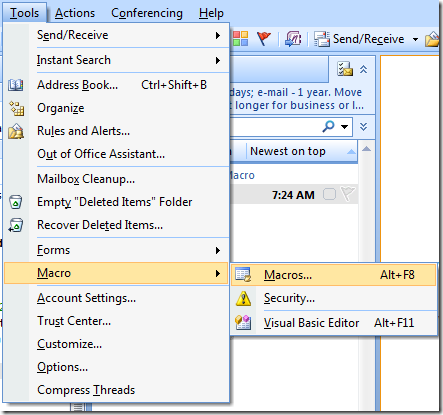 Click More Commands...now from this dialog select "Macros" from the dropdown, select your new Macro and click Add>>. Click OK and look at your Quick Access Toolbar...you've got a nice little icon there. Cool, mission accomplished. One less thing to worry about. Thanks Bill! That is a great trick. I would assume at least a large percent of the people who receive my email use Outlook. Out of curiosity, are there many people at Microsoft who do not use Outlook? I do know plenty of people who would rather use Mutt in Unix than use Outlook. The easiest way someone can tell this is a good blog post; you refer to yourself as a ninja and link to Real Ultimate Power. That is one of the best pages in the universe. Next to "The Best Page In the Universe" of course. Very nice. Any reason you're restricting forwarding as well, rather than just blocking the reply-all? does that do what I think it does? Run arbtirary code on the client machine? I liked this oprion. It would be nice if it is possible to use like a toggle button (revert the option to enable replyall/forward) which would change the icon when clicked. I'm with you Ayende. What's up with allowing macro code to execute on another machine? Didn't MS block this years ago? No, it's just a metadata switch. It's just a name:value pair that Outlook respects. It only works internally. Marius, no reason, just to see what else could be set. Easily changed. I see, very cool then, but you probably should make it explicit. How about bcc? This works always on every platform. People don't get to see all the users you sent the email to, but many times that's a good thing. How about using the "Have Replies Sent To" feature? Bruce - "Have replies sent to" only affects replies not Reply to All. Vijay - It's just two lines of code. ;) I like your feature idea, will you write the other two lines? Is there a way to enable/disable the tool bar button as it is pressed? So we know if "repy to all" is enable or not? Code change would have to happen as well. 'How to highlight toolbar icon? 'How to remove highlight from toolbar icon? I'm looking for the same effect as the confidential icon. This is nice but what I would really like to see is a feature in Outlook that warns you when you do a reply all that the email will be sent to 50,000 people. I think that would get folks attention and make them think twice about replying to all. I'm not sure what a reasonable default limit check should be - perhaps 40 people?? 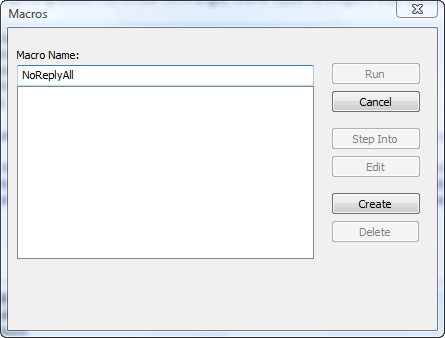 Of course, you would make it configurable by the user and group policy. 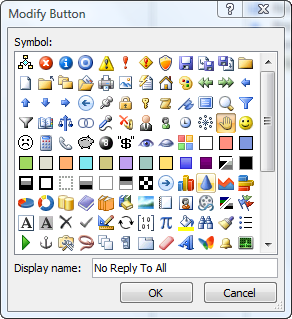 Just tried it in Outlook 2002 and it works as well; although it removes the ReplyToAll button from the toolbar instead of just dimming/disabling as it does in '07. 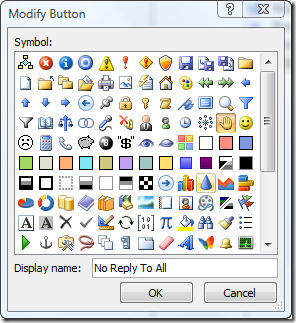 I did notice that (in Outlook 2002 anyway) the ReplyToAll icon in the application toolbar remains, so users who read their email in the preview window will still be able to reply to all. I agree with Tom and Matt, this is an absurd solution to something that can be so easily rectified by just BCC'ing the email list address. Ryan and Matt and Tom - With all due respect, there are loarger email workflow scenarios to consider. The problem with BCC'ing the list is that the rules that the person has setup won't fire and suddently the email will show up in their Inbox and not in the list folder. Ryan, one of the big reasons to have this fix is to avoid BCC - because BCC breaks everyone's inbox rules. The BCC mail shows up in the main inbox instead of the sub-folder assigned by the inbox rules. First, love the blog. Second, not sure how you keep the content so fresh with everything else you have going on! Thanks for all the info and being such an asset to the developer community. How does this work in Outlook 2003? I can't find a way to add the macro to the mail. 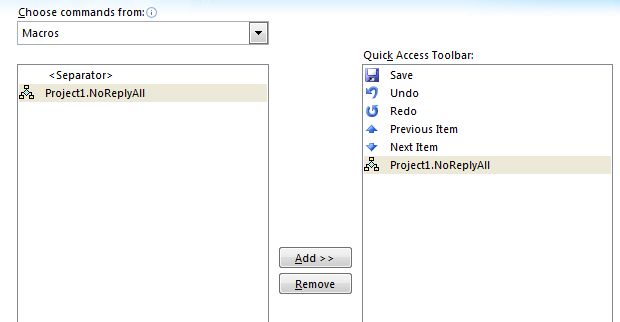 @Rob: Although the ReplyToAll icon is still visible in the application toolbar, it is disabled. Try clicking on it and you should see a message to that effect. 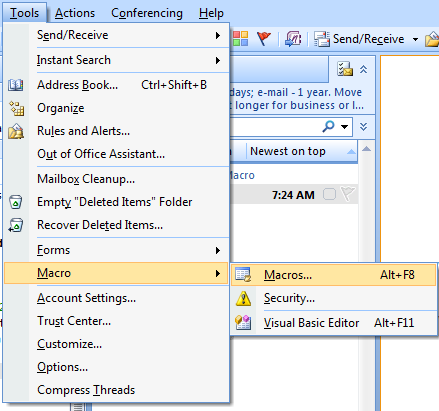 @Computhomas: In Outlook 2003, open a new email, click on Tools > Customize, go to the Commands tab, pick the Macros category, and you should see your macro. Just drag this macro to the appropriate place in your email toolbar. 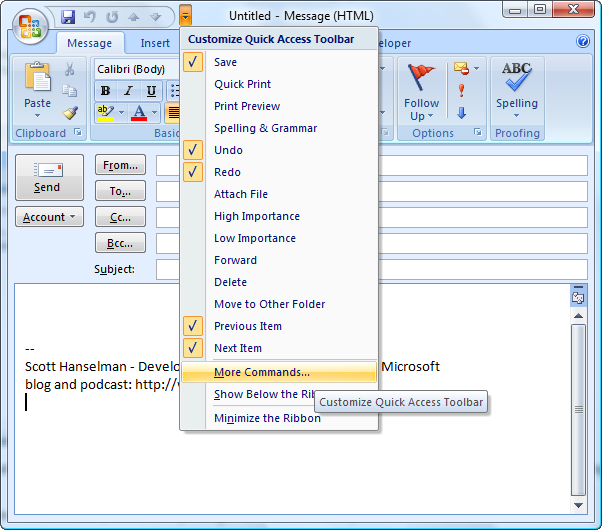 This macro is on my standard toolbar in outlook. I apologize up front, but I am still confused. 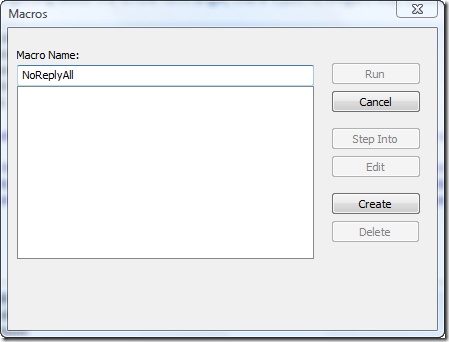 Is this a macro that is being executed by Outlook on the recipient's machine? Uh...am I the only person that thinks allowing macros in incoming e-mails to execute by defaul is a tremendous security hazard...? Even if your other reciptients are in your company (or outside your company but still running outlook) this seems to me to be a hugely dangerous approach to solving a lack of situational awareness on the part of your recipients, no...? Or am I misunderstanding the approach here...? Hilarious (and sad, and scary) how so many people immediately assume its a security breach. As a joke you could disable the Reply as well, and then send a message to your boss: If I don't get a reply from you I'll assume I can leave after lunch. 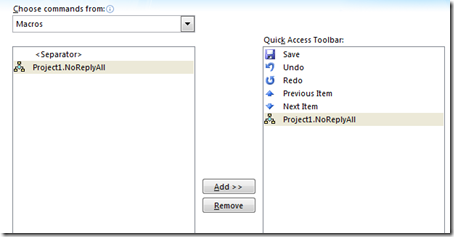 - Hit reply and then change the email address / add entries into the CC field? Of course. To prevent those would require IRM. This trick is just to discourage the knee-jerk Reply To All. That's a nice little piece of work -- but if I'm using Outlook 2003 with Word 2003 as my email editor, Word 2003 takes over and refuses to recognize ActiveInspector (and most of the rest of the email objects, as near as I can tell). Is there a workaround to make Word 2003 realize that it's working on an email so we can use this simple & elegant workaround for human carelessness? The ReplyToAll icon in the application toolbar is still visible/clickable in OL2003 when viewing messages in the preview pane, but if you actually click it you get a 'stop' message, so it is still functioning.